Last week we went up for the last night of Chanukah and Christmas. It was so nice to light the candles at my parents' house using the menorah we've used since I was a kid. Steph sent a box of awesome gifts, including a foot massaging ball and a SUP ornament for Matt to match my runner girl from last year. I got myself a little gift as well! Christmas was a lovely, laid-back affair this year. Matt and I went to his dad's early for breakfast. Tammy really outdid herself this year; we had hash browns (prepared as a casserole for all the gluten-y folks), eggs, bacon, sausage, OJ, and coffee. How cute is that mug?! After breakfast we opened gifts. Our presents this year definitely say a lot about where our lives are right now. We got lots of things for the house - decorations, a deep fryer, a comfy afghan, and gift cards to home improvement stores - and Matt got me a bluetooth keyboard (so I can write on my iPad) and Jaybird bluetooth headphones. I'm not sure why Matt is blurry in this one! We got Dave and Tammy a Chromecast and spent the morning setting it up and playing with it. My parents and I got Matt a GoPro and some of the necessary accessories, which he immediately tried out. This year I didn't run on Christmas. For some reason I just haven't been very motivated. But lately I haven't done much running - the holidays, travel, and house updates (more on those later) have gotten in the way - and I'm okay with the time off...But I can't let it go much longer. It's time to get serious again. Kristin and I are debating running the A1A marathon in February, and if I decide to sign on for that I'll need to get back into training. I know after all the yummy holiday goodies I've been over-indulging in, my waistline will thank me. What was the best gift you gave this year? Did you receive anything you know will be put to good use? These review posts are always so hard to write and tend to be long and rambling. I'm going to try to keep this one shorter than 2013's! This year was really huge for me, both in running and personal aspects. It was a year that ended up teaching me lessons about what I'm made of, my personal worth, my strengths, and my mettle. I think I'll always look back on 2014 fondly. I finally broke my half marathon PR by four minutes. The Paradise Coast Half was my birthday race, and it ended up being the perfect gift to myself. I ran Ragnar with an amazing team of women, many of whom became invaluable friends. Ragnar showed me that I am so much stronger and more capable than I ever thought! 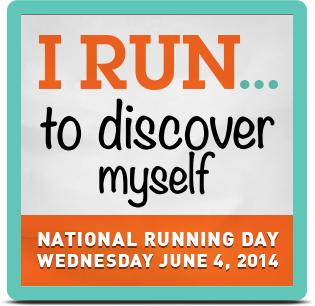 I took my commitment to positivity seriously and renewed my love of running through it. Sometimes just enjoying the run and smiling through it makes it magical. I ran my first full marathon. Matt and I bought a house. We still have a lot to do, but it's really starting to feel like home. I was selected as an All Star Teacher and got to enjoy three days of celebrity treatment, including being on the field with the players for the All Star Game. For three days of recaps, go here, here, and here. Those events alone are enough to call 2014 a success. Now, it's time to take a look back at my goals/resolutions for the year, some of which had to be adjusted or outright abandoned. Click for the original post. 1. While I did do quite a bit of cross-training early in the year, including T25, yoga, and Pilates, once I began training for Space Coast I let this fall by the wayside. Had I stuck with it, I think I would have seen better results throughout the year. I'm not happy with my commitment to this one and I think I'll need to revisit it next year. 2. Regarding training, I played it really cautious. I definitely think training smarter helped me avoid injury during marathon training this time around. I was better about putting my foot down and getting sleep when I needed it. But as usual, I wasn't very consistent in eating well. Damn my sweet tooth! 3. I purposely changed this goal once we bought the house this summer. 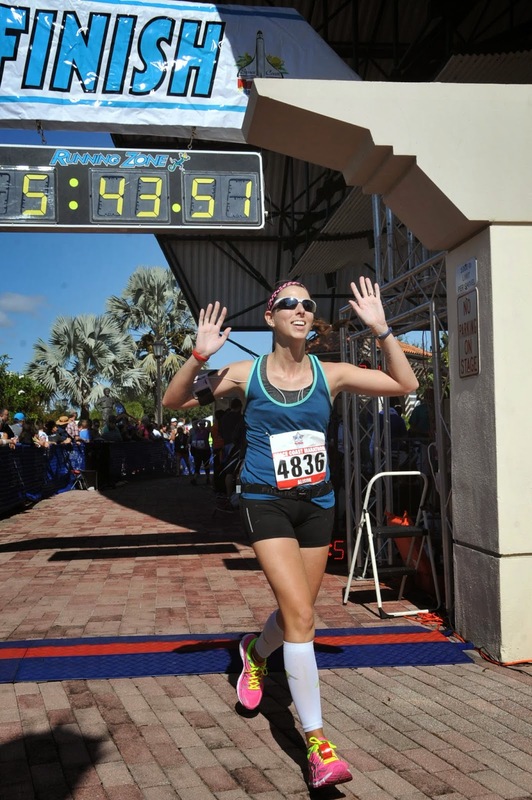 It just wasn't feasible to spend money on a bunch of races; plus, it was more important to me to race/train according to my plan for Space Coast. 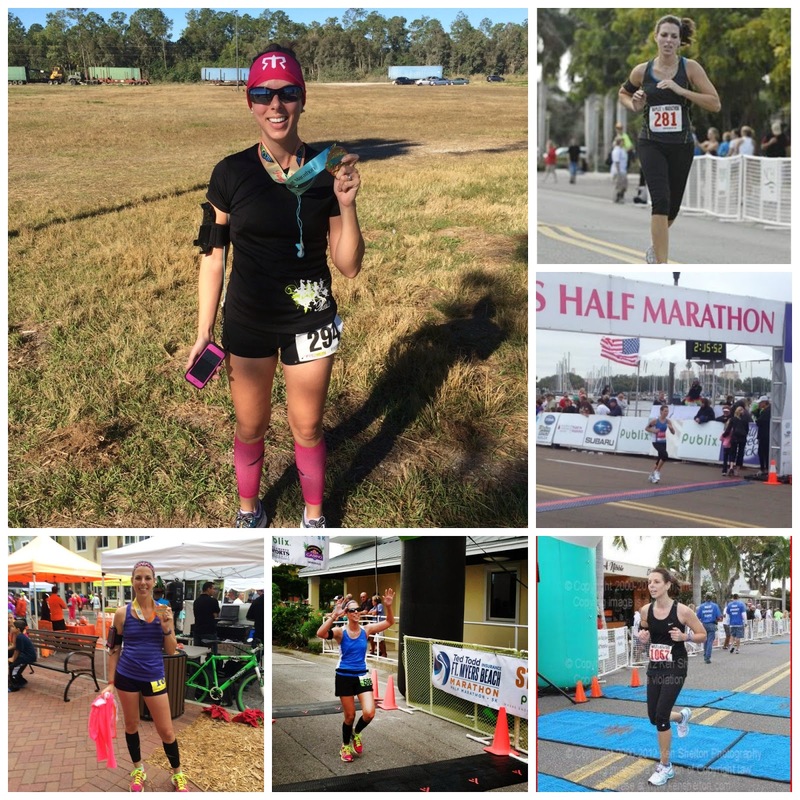 So I only ran eight races this year, and I'm perfectly happy with that. 4. I totally nailed this one. I really made sure to focus on enjoying myself and avoiding burnout. Even in the midst of hard races, I just stayed positive. In 2013, I had made a lot of time-related resolutions and I wanted to take a break from that in 2014. I think my commitment to being positive is what got me through Space Coast. This was a good year to relax and train a touch easier. That said, I'm excited to get back into working on my speed in 2015. Where does that leave me? Well, I need to take some time to carefully craft my 2015 goals, and that includes researching future races and such. But one thing is certain: next year has some big acts to follow. Did you accomplish your goals for this year? Do you make resolutions at the new year? I'm spending my first official Saturday of winter break finishing grades and cleaning the house for potential guests, so today's post is going to be super random. I haven't been running this week because for some reason the week leading up to break is more exhausting than normal school weeks; I'm excited to get to run on my own terms for the next couple weeks. So, let the random begin! 1. The lovely people at People/Target/MLB put together a 100-page, full-color photobook for this summer's All Star Teachers and mine came in the mail a little while ago. It's absolutely gorgeous and captures all the best memories from the trip. I am so grateful that they thought to do this for all of us! 2. December for teachers means sweet gifts from students. I never expect them but I definitely appreciate them. One student got me this absolutely gorgeous nutcracker. I've never had one before and it's such an original gift! 3. Still on the topic of holiday gifts, most of my students give me Christmas gifts, but one in particular this year remembered that I'm Jewish. It's a little thing that really made my day; plus, she spelled Hanukkah right! 4. If you missed it on Instagram, I finally cut my hair. I love my stylist so much; she always knows exactly what I want. I showed her some pictures and told her I was ready to chop it all off and this was the result. I was grinning through the entire cut; I didn't have even one second of remorse as six inches of hair fell to the floor. 5. I found these little snack packs of olives and am addicted. I love olives and I love the convenience of these packs. You know the theory that pickle juice is good for cramps during long races? I wonder if olives would have a similar effect. I plan on experimenting with these next time I'm training for a marathon. Please tell me I'm not the only one who still has flashbacks to Blue's Clues upon the arrival of the mail. Anyone? Bueller? Wow, two 90s references in three sentences. I must be in a mood. Anyway, I'm really excited. Two amazing things came in the mail this week. The first was a post-marathon gift from my mom, as if she hadn't already done enough by driving across the state to cheer me on at a sport that, for non-runners, can be pretty boring to spectate. After seeing so many runners in skirts at the race, she told me she thought they were adorable and wondered why I didn't run in one. I told her I had one, but it didn't have enough pockets for a marathon, and I'd bookmarked one I really wanted to get when the time was right. 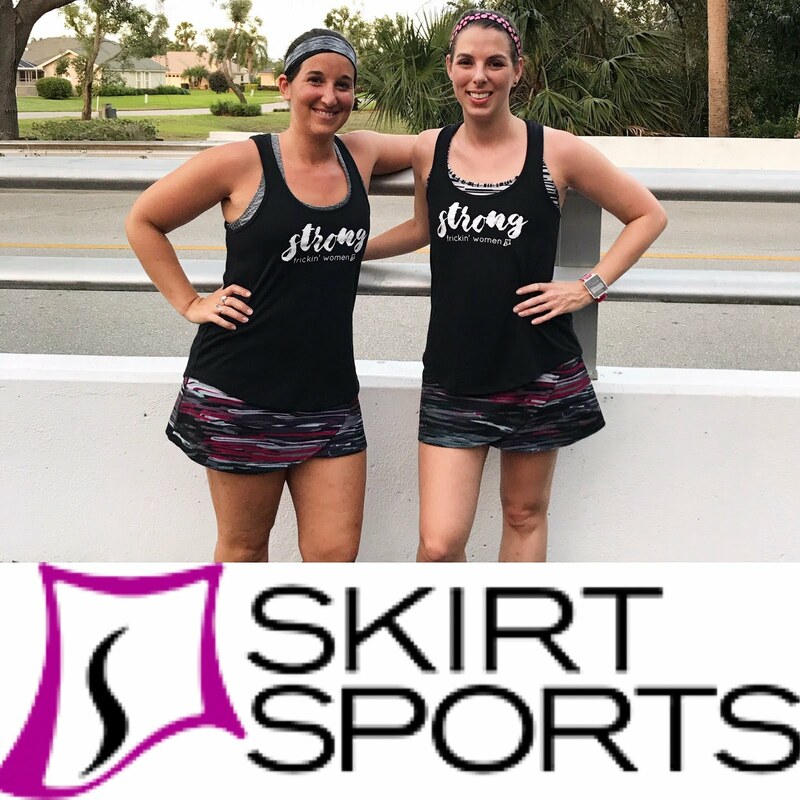 She went ahead and bought the skirt I've been coveting from SkirtSports. I instantly fell in love. The skirt boasts three roomy pockets (two on the undershorts and one zippered pocket on the waistband) that are all large enough and secure enough to fit my iPhone. I'm in love with the pleats! The shorts have a wide rubber grippy along the hem that keeps them from riding up even an inch, and they're long enough to prevent any kind of chafing. Showing off one of the pockets. Of all my shorts/skirts with rubber grips along the legs, these work the best. The skirt fits so nicely and goes well with every top I own. Somehow wearing cute clothes makes me feel awesome during my run; I couldn't stop smiling Sunday when I took it for a test run! I want like...a million more of this skirt. It will definitely be my go-to for long runs from now on. The other piece of mail that made my week was, of course, also running related! My new race decals finally arrived! Matt applied the stickers and I did the honors of carefully pulling the backing off. They turned out just how I waned them to! I've been having a little trouble motivating myself to get back into a set schedule for running. I'm sure my lethargy will pass once winter break starts. Two days, people! I know I can make it! Oh, and it's the first night of Hanukkah! So happy Hanukkah to any of my fellow MoT out there. I can't wait to have some latkes this week; I just have to decide which kind I want to make! Do you ever wear running skirts? What was the last piece of mail you got that made you smile? What does a 20-something teacher a week away from winter break do on her Friday night? Crafts, of course! Admittedly I'm not a very organized person, but I really wanted a way to put all the photos and memorabilia from the marathon into one place. I had so many photos, etc, to keep that it seemed like overkill to frame and display them all; a scrapbook seemed like the way to go. After work I stopped by Target to pick up supplies (and let me just say, the snowbirds were out in full force and I spent a good ten minutes in the parking lot laughing myself into tears at some of the "driving" I witnessed), then spent the rest of the night diligently piecing together my memories. Photos and supplies are ready to go! I took a break for dinner and observed the mess I had made of the living room. Being crafty isn't tidy, that's for sure. Matt and I watched Edge of Tomorrow while I finished my project. I was pleasantly surprised. I may think Tom Cruise is a few sandwiches short of a picnic, but he's still one of my favorite actors. I'm really happy with how the scrapbook turned out. I fit in the photos I liked most, my D-tag, notes of encouragement, and pages from the welcome packet. Plus, the blog came in handy; I printed out my recap and added it to the end. Bart Yasso and the Sub 30 Club got their own pages. A few pages from the finished book. Now I can annoy guests by insisting they look through the scrapbook. Isn't that the main purpose of photo albums and the like? The bad news is that I may have found another hobby I want to take up...putting the book together was really fun and relaxing! 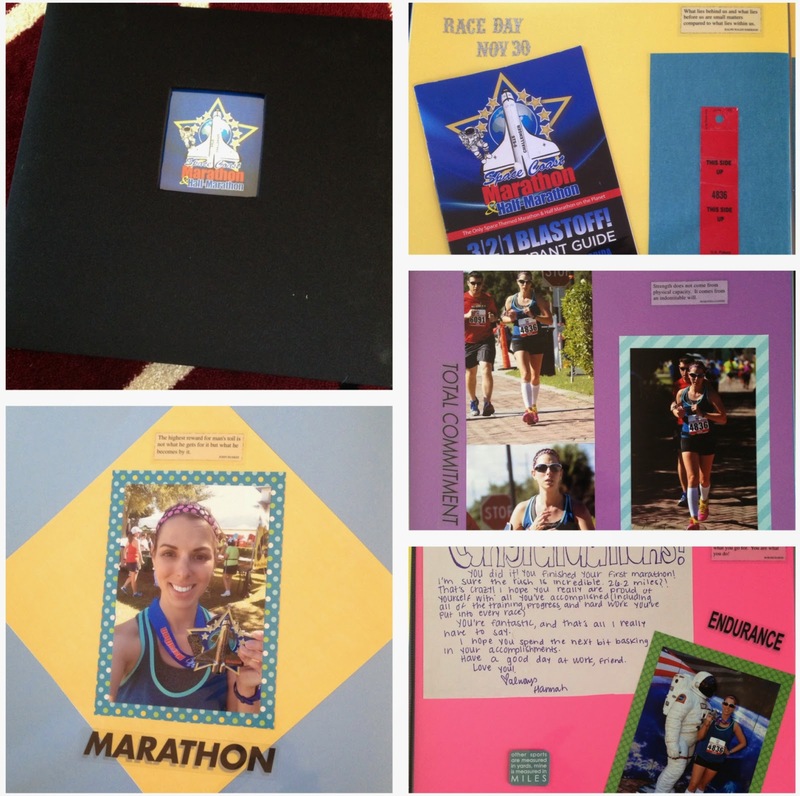 How do you save and store your race day memories? How do you typically spend a Friday night? Are you a Tom Cruise fan? Today, I went for my first run since the marathon. I felt so free and happy. 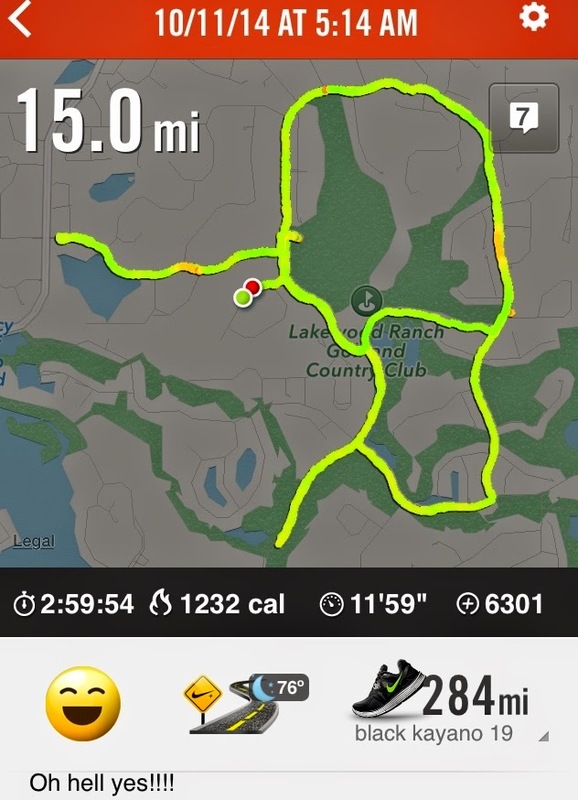 I didn't have any pain in my foot, the cold air gave me a little extra energy, and I hadn't realized how much I missed running on the golf course! The whole run was like being reunited with my best friend! After my run, Sanya Richards-Ross's voice came over Nike+ and congratulated me on a good workout. I kind of laughed; I did not consider this run a workout. Physically it had all the makings of a workout, but mentally and emotionally it was such a treat. I put my shoes on and realized my D-chip was still there! That gave me a little extra pep in my step! It made me pause and kind of think about how I look at running. I've always said that I don't like working out, and I still mean that. I just don't enjoy "working out" in general. It's why I've never been a consistent gym-goer; it's why I often skip cross-training days even though I know they're good for me. But oooh, how I love running! I guess it still counts as a workout (physically, at least), but I just don't put it in that category! 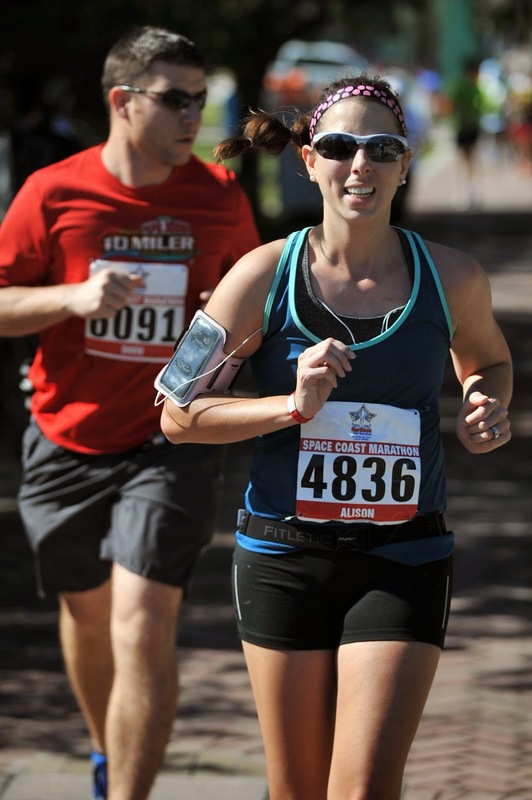 In other news, I got a coupon code for my professional race pictures and ordered them. Here I am crossing the finish line! This picture absolutely fills me with joy. I'm going to order prints and make a scrapbook. I can't wait to get started on it! Do you put workouts you love in the same "working out" category as other workouts? Here's something you may not know about Matt: he's an artist. 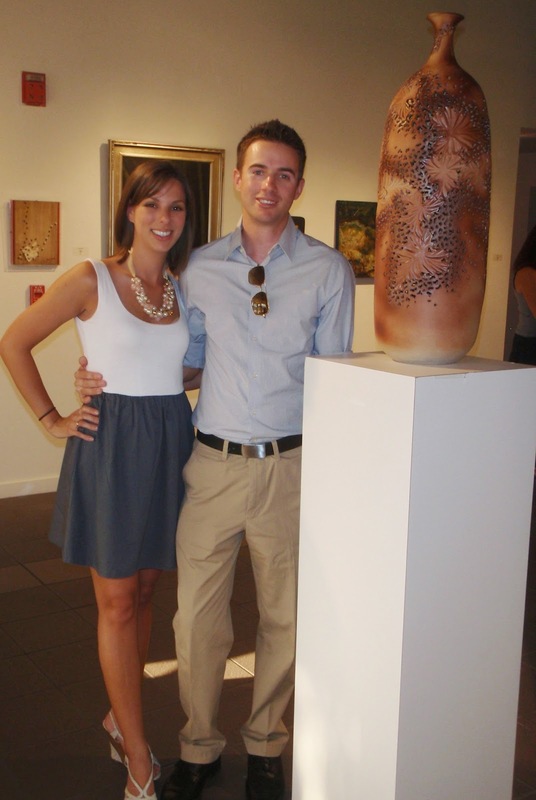 Matt has worked with ceramics since high school and has been featured in art shows, won awards, etc, for his pieces. However, we don't really have the time or space for him to get into the studio these days, so he works to stay involved in the art community by volunteering with our local Art League. Us and one of Matt's pieces a few years ago at an art show. Recently, his years of volunteering really paid off; he won a drawing for a free weekend trip on Captiva Island! The weekend after the race seemed like the perfect time. After traveling for hours the previous weekend and jumping back into work, complete with volleyball games after school, I was ready for a mini vacation! Friday after work, we followed a beautiful sunset over the bridge into Captiva. We ate dinner at our hotel, the 'Tween Waters Inn, and then settled in for the night. The Crow's Nest's shrimp & grits was the best I have ever had! Date night selfie. Matt's beard is getting a little out of control; we're in a friendly standoff to see which one of us demands it be trimmed first. Saturday we had breakfast at RC Otter's and explored the island a bit before enjoying ourselves pool-side (in December, yes indeed!) and exploring some mangrove tunnels in the afternoon. Our prize package included coupons for free libations. Ah, December in Florida. Jealous? These were some of the best mangrove tunnels I've ever been through. Fully shaded but nice and wide! After paddling, we went to The Mucky Duck for dinner. There are so many quirky, famous places to check out on Captiva, even though the island is small. We missed a golf cart float parade, but The Bubble Room's float was out front. Impressive! We slept late Sunday, but luckily the Key Lime Bistro serves breakfast until 2pm because I was really craving some heuvos rancheros. We explored Sanibel Beach and the lighthouse before heading home. We're a little late getting our tree set up, but Matt and I both take a hard line against putting up decorations before Thanksgiving. We put the tree up as soon as we got home Sunday afternoon. We had to bend the top of the tree to fit the star on there; it may be time for a new one! This is our first Hanukkah/Christmas in our very own house. I love how the tree makes the entire living room feel warm and homey. 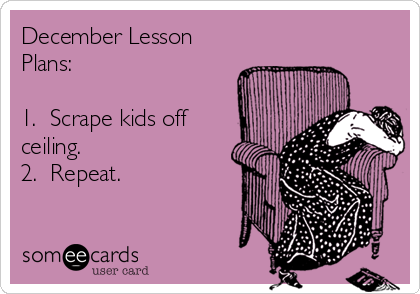 I can't wait to break out the menorah, but we don't set that up early because you can't light it until the holiday starts anyway. This relaxing weekend away was so appreciated. Just before winter break, things start to get pretty stressful; this was the perfect way to unwind, and now I'm feeling 100% back to normal. Volleyball playoffs are Monday, after which I'll have the time (and the necessary recovery) to get back to running! What was the last weekend trip you took? Have you ever been to Sanibel/Captiva?